For your rants, woes, confessions and worries, Reid Rivers is all ears. 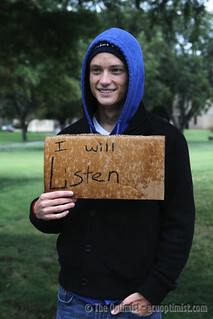 The freshman vocational missions major from Juneau, Alaska, can be seen standing in silence on the walkway between the Campus Center and the Brown Library, holding a cardboard sign with the offering: I will listen. Rivers took on the solo project, with sign out and ears ready, at the beginning of October. So, like any good innovator, Rivers recognized a problem and created a means to fix it. The idea came to Rivers after his family moved to Juneau this summer. He and his sister connected with a campus crusade group visiting the city for a summer project. Rivers said the cardboard come-and-go confessional has been an unexpected success, with crowds coming to him with their concerns and questions. Because listening doesn’t come natural, Rivers said. But the task of telling a stranger is complicated, too, he said. Rivers said we as humans, particularly the men, are hard-wired to mask our shortcomings because we live in a culture that associates displaying emotions as a sign of weakness. Rivers said the project has become equally ministering to him by disciplining him on how to communicate not only with others, but with God. Though Rivers is available to listen almost every weekday after chapel, he has taken after-hours sessions as well. But how long can he keep up his sign-holding project? “Until the Lord tells me my task is finished,” he said. Rivers said he would like the “I will listen” ministry to stay small, to keep value in the personal relationships. But there are many ways students can similarly serve their peers, he said. Rivers encourages students to use their God-given creativity, listening and watching for opportunities he provides. “Anything that takes you out of your comfort zone and allows God to do his work, because it’s all about Him,” Rivers said.